Today was another fine day- nothing too exceptional to report. I did try something new for breakfast- eggs baked in avocado halves. 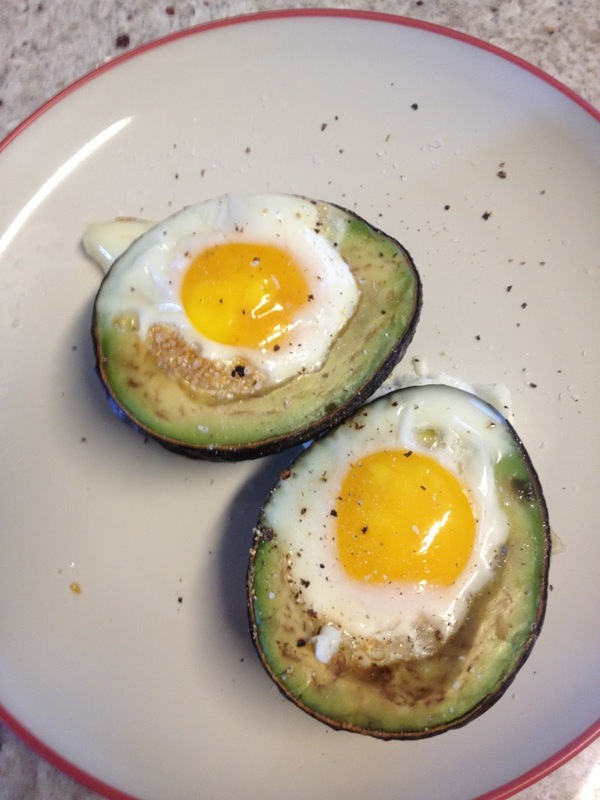 Basically, you cut an avocado in half, take out the seed, scoop out a little of the avocado and crack an egg into each half. Bake at 425 for 15-20 minutes, depending on how done you like your eggs. It was pretty good, and a nice change from the scrambled eggs. We had the garlic lemon chicken for dinner and while it tasted good, I think the next time I make it I will just use chicken breasts instead of whole chicken. I'm not a fan of dark meat (or bones), so I did feel that wasted a bit of the chicken. Luckily, my husband is not as picky and doesn't mind de-boning chicken. This morning I had scrambled eggs and broccoli for breakfast, which I am surprised to say that I do enjoy having that for breakfast. My husband is currently off work for a couple weeks, so we decided to go to a movie this morning while all of our kiddos were off at school. We saw 42, which was a really good movie. My husband did enjoy pointing out that movies are a lot less expensive when you skip the popcorn and cherry coke. For dinner tonight we tried the Everyday Meatloaf from Everyday Paleo. I also made some garlic mashed cauliflower to go with it. It was a very yummy, my oldest even asked for seconds. According to my husband, it was the best meal of the week. Which is nice because it was pretty easy overall, it's just the cooking that takes the most time. So it looks like we will be having that again soon.